Writing a thesis is painful. And it should be. But the pain should rest in wrestling with ideas and data not with software. Scrivener takes the pain out of the software side and ensures that your attention is always in the right place. Reason 1: Scrivener offers an excellent writing environment in which it is very easy to switch back and forth between outline view and full-screen writing mode. This helps structure your mind to use full-screen composition mode when you’re in writing, outline view when you need to focus on structure and view and edit multiple scrivening when you’re editing and rewriting. Reason 2: Scrivener makes it easy to keep track of the status of chapters and subchapters. 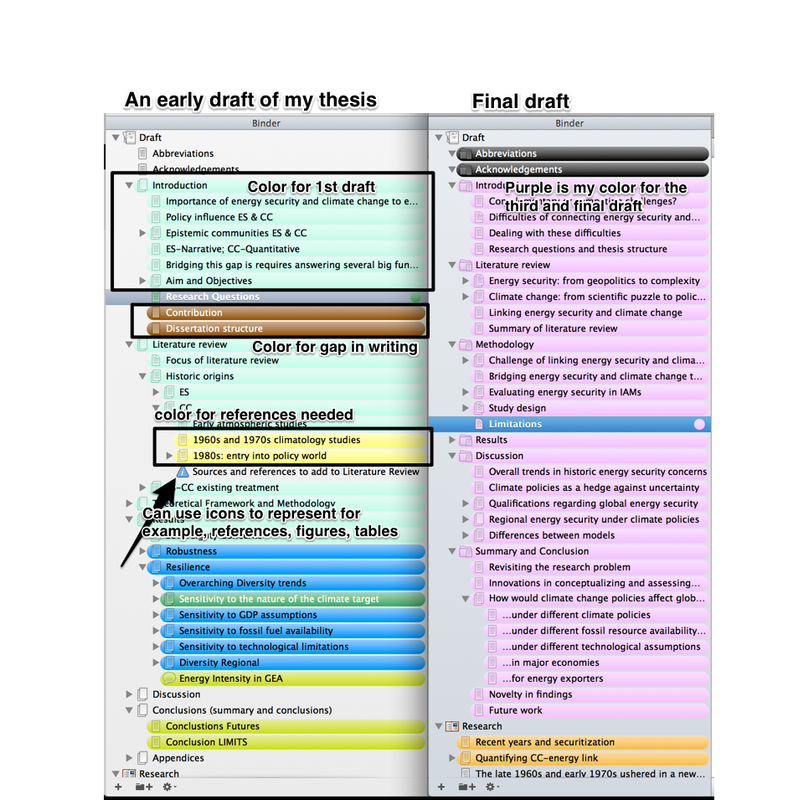 In my thesis, I used a color to designate status (1st, 2nd or 3rd draft) and binder icons to represent figures, tables and unused references. Thus, at a glance, I can see how many figures or tables are in a given section or chapter. Reason 3: Snapshots in Scrivener] make it easy to capture a version of text in case you want to revisit a previous version after you’ve edited it. Reason 4: The ability to set and track targets in Scrivener is invaluable for thesis writing. And finally Reason 5: You won’t be exposed to Word’s instability when using cross-captioning and cite while you write in a large document. Jessica Jewell is a Research Scholar at the International Institute for Applied Systems Analysis. This entry was posted in Writing and tagged Scrivener. Bookmark the permalink. Thanks Daniel. I agree with you that it often works well to outline outside of Scrivener. I typically use Omni Outliner to structure the writing flow. I tried Circus Ponies Notebook but didn’t like it. One issue I constantly face in using Scrivener for writing is the citation. Most Latex editors can automatically insert citation keys in the documents automatically. Scrivener couldn’t do it. The magic citation of Papers was a good alternative for automatically inserting citations. But, Papers is really poor for Latex bibliography…writing Latex document in Scrivener is still inconvenient. I would be glad to know if sb has a way around. The way I deal with this is use the magic citation of Papers to insert cite keys (in MMD mode). Then when I export to LaTeX, I also export a bibtex file of my Papers2 library and use bibtex to produce a bibliography in the final version. Does that help? yah, that would make a good workflow except that I am a Sente user. I am completely seduced by the annotation feature and the tag hierarchies of Sente. Still, Sente has no feature as Papers. I have to export from Sente to Papers if I have to use the Magic manuscript. That made things a bit complex to workout. I am now trying Sublime Text 2…seems to solve some of my problems. though I will miss some of the great features of Scrivener you are listing in here. Thanks for the reply, bzw. Thank you for a great post! How exactly do you color-code status? I was able to find that function only for labels. Great question Olga! I detail that feature here. It’s simple but not easy to find initially. Nice post. I love scrivener for thesis and articles writing. I can manage citations with Papers2 pretty well. The only bug I have is when I manage tables (I keep all graphs done with R in a pdf), in the Compile process the formatting is always messy. Any tips? What do you compile to Ale? Word? or LaTeX? Also are “tables” made into figures in R? Is that your workflow? Thanks for the post – I’m new to the whole post-Word world. I think Scrivener is the one for me because of the flexibility of writing uses, but I worry about citations. What reference management software does it work best with (am in the market for one of these, too)? I use Papers2 magic cite keys. They are plain text. Then I compile to either TeX or Word. I word, I run papers to generate citations and a reference list. If I compile to TeX, I export my Papers library as a BibTex file and compile using TeXShop. Really useful Jessica, thanks for the tips! For figures and tables, I have two workflows. If I compile to TeX, I put raw TeX code for the figures and tables and then compile from Scrivener and compile in TeX shop. If I am compiling in the manuscript in Word, I put the table and figure numbering in Word using cross captioning. I use Zotero with Scrivener, compile to .rtf, scan with Zotero to make Bibligraphy. Works very well, with many different bibliography styles. Thanks for linking to one of my posts here, Jessica. Scrivener is key for any writing these days. I almost feel sorry for all other writing software. I am an undergrad and just discovered Scrivener during the winter break. I am looking forward to using it to write my papers. It is my understanding that the “right” way to use Scrivener is to use it to work on the content and then import it into Word or some-such program to polish the formatting and appearance. In the past I have used Word to write my papers + the addon software StyleEase to handle my citations (I own all three editions: MLA, APA, and CMS) and I plan to continue that but I will use Scrivener’s annotation feature to contain “fast & dirty” citation information including any quotes. When imported into Word those annotations vanish from the main text and appear as sidebar balloon text boxes with little red lines pointing to the exact place where the citation needs to be inserted using StyleEase. If there is extensive citation information I can always have copies of those sources in the references folder and work off of those in a parallel window with Word. Doing it this way I can focus on the *content* of my sources and I will not even need to *think* about the citation *formats* until I am ready to insert them as the very final step of writing my paper. StyleEase will automatically build the bibliography/works cited/references pages and the per-page footnotes as the citations are inserted. This sounds very smart. I also don’t like to think about citations too much when I am working on my first (and even second) drafts. Then I let Papers handle my citations.